It seems like an age since I last wrote. After a slow start to the year, the Summer cottages weeks literally flew off the shelves and we can now announce we have had our busiest year ever. 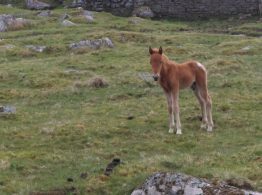 It has been exciting and hectic with the website bursting with enquiries and many new guests enjoying Darrynane as well as a sprinkling of well known faces – quite lovely. Personally we have had a great year too with Ameisha achieving her A Level’s and getting into Reading University to study Ancient History. She quickly settled making lots of friends and is pleased with her module choices. After two weeks of freshers proper studying started this week so we hope she remembers why she has gone to uni! Tim and Seb have had manic Summers, working long, long hours in their respective careers. They are both looking forward to life calming down over the Winter – and working a normal 40 hour week – they are both still smiling. David and I seem to have constantly entertained over the Summer as both family and friends decided to visit one after another – it has made this year very special. 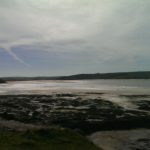 It has also given us the opportunity to get out and about and enjoy our local Cornwall. 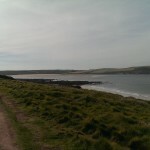 Daymer bay and Polzeath beaches have both been a favourite as well as Tintagel cliffs and Cardinham Woods and of course Bodmin moor. On our way back from Exeter last week we stopped at Finch’s Foundry, a National Trust centre. We didn’t have time to go around the workings, it’s a diary date for another day, but we both enjoyed a well made coffee and tasty blackberry cake – yum. Dogs are welcome and there are walks around the garden and beyond too. Late September and a gloriously sunny day, we made one of our many trips to the cliffs between Polzeath and Daymer Bay. The time of the Super moon and wow what a spectacle. 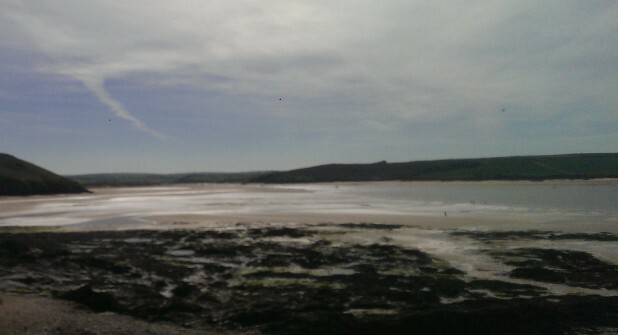 With the tide out far beyond anything we had seen before creating a wide sandy beach from Polzeath right around to Daymer and onwards to Rock. The Doom Bar was clearly exposed allowing people to walk along it and surfers to catch a wave or two. Offshore, Gulland Rock displayed a clear water line with the sea lapping way below – difficult to tell how low from the distance we were observing from. One of my joys this year has been my herb garden. I planted a small one in a border near the front door many years ago and I have always wanted to expand but with time pressures it never seemed possible. In early Summer David and I were bargain hunting in Trago Mills, with bags of various items we entered the garden section. 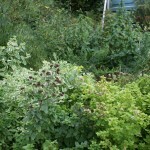 I checked the herb area, usually light on varieties and hey presto they had a huge selection. We quickly found a trolley and began stacking. We prepared the area next to the green house and started planting: Rosemary, Sage, various Mints, Oregano plain and variegated and golden, Majoram, Fennel, chives, thyme, Curry plant, Lavender, Cotton Lavender, Sweet Woodruff and Rumex and hardy Coriander – a very special plant. Most have survived and are growing well. It looks great it’s so nice to have fresh herbs to use in my cooking. Bookings are coming in well for next year especially Easter so if you are thinking of a holiday for next year let us know so we can pencil you in or go on our website and book the week you want. We have 1 week available at The Stables from 16th October and cottages for short breaks or weekly from 30th October.